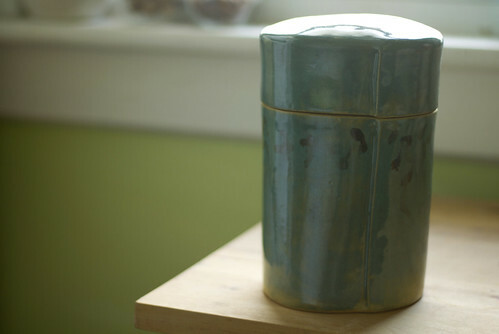 This is a super fancy ceramic flour canister my sister gave me, and this photo really doesn’t do it justice. It’s glazed a beautiful, pearlescent turquoise, and was made by Salt Grass Potters. It looks absolutely perfect in my kitchen. 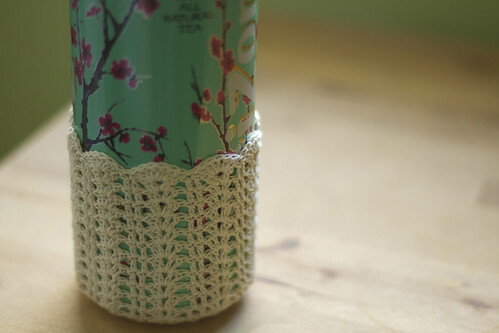 This, ladies and gentlemen, is the most delicate, crocheted can coozy you have ever seen. I got half a dozen from my Grandma-in-law, and I have never felt more resplendent drinking a canned beverage. 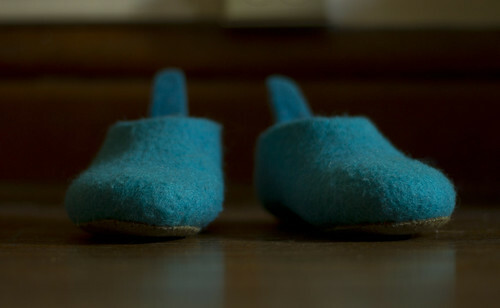 These are felted wool slippers of unbelievable coziness, and they were handmade in Nepal and hand-picked by my aunt. Those tabs on the back of the slippers are meant to aid in the slipper donning process, but I appreciate them more for their ability to make the slippers look like elf shoes. There really are no words to describe how awesome this is. It is going on my wall, stat. 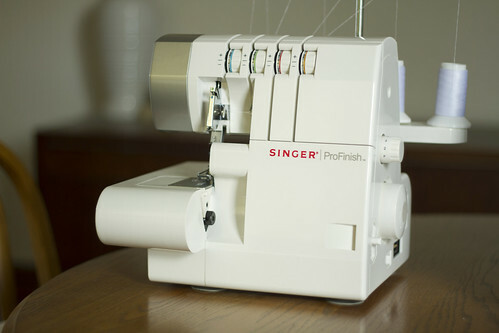 A serger! I have no idea how to use it, but as soon as I learn, you can be sure I’ll be churning out all kinds of fancy serged garments. Thanks, Mom! 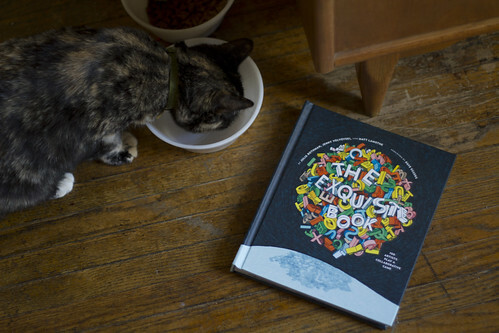 I have spent a fair bit of time reading every published word Dave Eggers has ever written, and while I think the guy’s pretty swell, his foreword in this book is probably the least interesting thing about it. One hundred different artists play a version of this game, with each work of art connected only by a similar horizon line. It’s pretty fantastic. These things are just the tip of the iceberg– I got more gifts this year than is even remotely reasonable, and they were all awesome. Many thanks to everybody that showered me with presents! Coming up soon: basket weaving. Stay tuned. Posted on January 2, 2011 by Jessica This entry was posted in Life. Bookmark the permalink. At least you’re honest about the spoiled rotten part. Is “Neck Fat” going next to the old man? No, the old man takes up the whole wall he’s on. 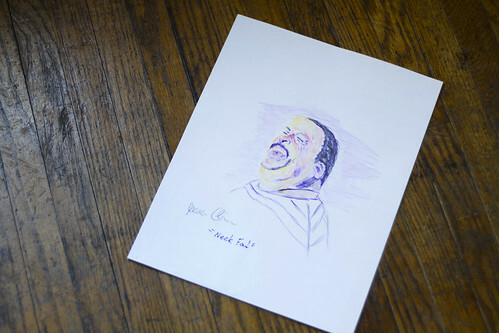 I think I’ll put “Neck Fat” on the wall in my craft room. would you mind sharing who makes the slippers or where they are from? i have been searching for ages for something like them. raini– the slippers are from a group called “Association for Craft Producers” and they were purchased in Nepal. they do have a website, but they don’t sell merchandise online. sorry!